Composite Skirt and Little Composite Skirt are souped up versions of the base Composite Twin model, made with even more volume for more effective fishing in thick cover. As in the original, it is has a back slide action when rigged with no sinker, and due to the hula skirt is has an improved natural appeal when fishing in cover or into weed pockets on a Texas rig. The skirt also makes slow action possible too. The extra volume gives it more weight for great castability and control even on 20 lb line, flipping stick combinations. Composite Skirt and Little Composite Skirt drive the angler into even thicker cover, with no hesitation. The body is designed with small ribs, for the hook point to be buried in, stopping the hook from coming out in the weeds but holding it just enough, so that it releases when bass bite down. 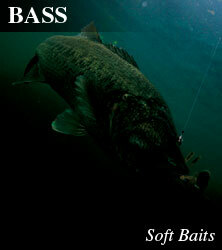 This special design allows for great hook holding power and fantastic hooking at the same time. Composite Skirt and Little Composite Skirt are the lures to take on big nervous bass hiding in heavy cover. Effective for standard heavy Texas rigs, it is also designed for easy use with the ultra heavy cover "Punch Rig" too. Attaching it to a rubber jig makes for a very effective high appeal trailer. Designed with a wide body all the way to the end, the hook point is easily hid inside the end of the body. The secret to great hooking with the punch rig, is to put the hook point close to the outer edge of the lure body. A 5/0 hook is a perfect balance for a Little Composite Skirt Punch rig, and highly recommended. COMPOSITE SKIRT 4-1/2"class / 100mm 5pcs. LITTLE COMPOSITE SKIRT 4"class / 102mm 5pcs. *Place the cursor over the lure to see the colour on the reverse. 243 Classical Cinnamon / Blue + Black Flk. 282 TENAGA Shrimp Copper Flk.